They are NOT vegetables or worms! Like sea stars, they have 5-part symmetry but lengthwise. Sea cucumbers make up 90% of the deep sea ecosystem and can be considered the dominant lifeforms of the planet! Where seen? Sea cucumbers are commonly seen on many of our shores. On sandy patches large sea cucumbers may move about on the surface, while smaller ones burrow. In coral rubble areas, they may hide under or cling to the rubble, seaweeds or other animals such as sponges and ascidians. On the rocky shore, some hide under the rocks. Many lie buried in the sand, only their feeding tentacles emerging above ground. What are sea cucumbers? Sea cucumbers are animals and NOT vegetables as their common name suggests. Often mistaken for worms, sea cucumbers are related to sea stars and belong to Phylum Echinodermata. Class Holothuroidea has about 1,200 known species. Some are colourful and easily seen, others are well camouflaged or hidden under stones or in the sand. Sea cucumbers can be round as balls, long and worm-like, or even U-shaped. They are found almost everywhere from shallow areas to the deep sea, from tropical to the Arctic and the Antarctic. 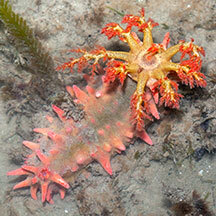 Wormy Echinoderms: Sea cucumbers look quite different from their echinoderm cousins such as sea stars. Sea cucumbers don't have arms, obvious spines or a hard skeleton. They are instead soft and worm-like. But like other echinoderms, they are symmetrical along five axes. Instead of lying on their mouths like sea stars, brittle stars, sand dollars and sea urchins, sea cucumbers lie on their sides with their mouths on one end and backsides on the other. Sometimes mistaken for worms or other sausage-shaped animals. Here's more on how to tell apart worm-like animals and sausage-shaped animals. Sometimes, the feeding tentacles of a buried or hidden sea cucumber is mistaken for a sea anemone or other feathery animals. Here's more on how to tell apart feathery animals. Feeding with their feet! Most sea cucumbers have tube feet. The tube feet around the mouth are modified into branched or feathery feeding tentacles. 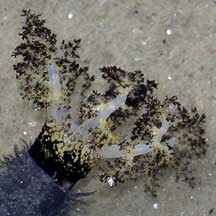 There can be 10-30 such tentacles, which can be completely retracted into the body. Most have tiny tube feet which are used to cling to surfaces and things. Only a few use their tube feet to creep on. In some, tube feet emerge in rows concentrated on the flattened lower half that faces the surface (called the sole). 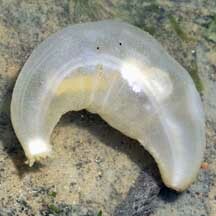 In others, the tube feet may be scattered all over their body. Sea cucumbers that lack tube feet include synaptid sea cucumbers and those sea cucumbers that burrow. Morphing sea cucumbers: Instead of a hard skeleton, the bodies of sea cucumbers are mostly made up of mutable connective tissue that they can rapidly change from soft to rock hard. This tissue plus well-developed layers of muscles (around the body and along its length) helps them to move about; flow into narrow places to hide; or disuade predators from taking a bite out of them. They also have ossicles (hard pieces of calcium carbonate), but these are microscopic and widely distributed in their mutable connective tissue. In some sea cucumbers, their ossicles can give their skin a stiff and rough texture. Sea cucumber ossicles take on a wondrous variety of delicate shapes and are used to identify sea cucumber species! Breathing through their backsides! A unique feature of some sea cucumbers is an internal breathing system of branching tubes along the length of their bodies. Called respiratory trees, most large sea cucumbers have a pair of these, each connected to the opening on the backside. To breathe, the sea cucumber pumps water in through its backside and up through the respiratory trees. The water is then flushed out through the backside again. With this constant flow of water, some tiny creatures find the backside of a seacucumber a cosy and safe place to be! These include pea crabs and the Pearlfish. Small or thin-walled sea cucumbers, however, simply breathe through their skins. Dust Busters of the Sea: Most sea cucumbers eat detritus, collecting this in their sticky, mucus-covered branched or feathery tentacles by sweeping the sea bottom or waving their tentacles in the water. The tentacles are then inserted one by one into the mouth and sucked clean. Some simply shovel sediments into their mouths with their tentacles and process the edible bits, leaving behind them a trail of sausage-like lumps of processed sediments. Some sea cucumbers have been estimated to process 130kg of sediments per year! Repulsive vomiting: Being soft and slow, sea cucumbers protect themselves by hiding or being unpleasant to deal with. Some have toxins or distasteful substances in their bodies. To repel and distract predators, some sea cucumbers vomit their entire digestive system and other internal organs such as the respiratory tree and even their reproductive organs. Depending on the species, these can emerge from the front or back end of a sea cucumber. Some species eject toxic or sticky strings (called Cuvierian tubules) from their backsides. These immobilise the predator in a gummy mess or release toxins. The sea cucumber eventually regrows its innards and arsenal of Cuvierian tubules. Please don't make sea cucumbers expel their intestines. Not all do this. Those that do cannot eat until they re-grow their innards. The guts or other noxious substances may irritate your skin and may hurt you if these get into your eyes or mouth. Cucumber babies: Most sea cucumbers have separate genders and are usually either male or female. Their reproductive organs are near the front of their body. In most species, sperm and eggs are released simultaneously for external fertilisation. Some spawning sea cucumbers raise their front end in a cobra-like posture when releasing their eggs and sperm. Observations suggest spawning is synchronised, sometimes more than one species spawning together. Sea cucumbers undergo metamorphosis and their larvae look nothing like their adults. 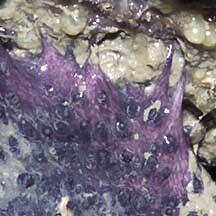 The form that first hatches from the eggs are bilaterally symmetrical and free-swimming, drifting with the plankton. They eventually settle down and develop into tiny sea cucumbers. Role in the habitat: Sea cucumbers dominated the deep sea ecosystem and can make up 90% of the creatures found there. Here, some have very long tube feet to stilt walk in the mud, others have webbed tentacles to briefly swim. Since this ecosystem makes up about 70% of the surface of the earth, sea cucumbers can be considered the dominant organisms on earth! 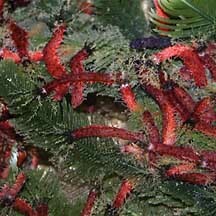 Being so numerous, sea cucumbers are important to the ecosystem. Their larvae are probably important in plankton-based food chains. The constant processing of sediment by countless sea cucumbers possibly plays a role in nutrient recycling. Human uses: Some large sea cucumbers are considered delicacies and harvested for food. The harmless Garlic bread sea cucumber (Holothuria scabra) is among those species of sea cucumbers that are collected as a Chinese delicacy. They are gutted and dried for sale as 'trepang' or 'beche-de-mer'. Sandfish, which can grow up to 40cm and weigh 1.5kg, are the most widely collected and among the more valuable sources of beche-de-mer. Tests indicate these sea cucumbers contain toxins. They must be properly prepared before they are safe to eat. Others may be collected for the live aquarium trade. Scientists are also studying the toxins of sea cucumbers for possible medical and other applications. Status and threats: Collection of the garlic bread sea cucumber has been a traditional activity for centuries in many coastal peoples in many parts of the world ranging from Madagascar to the Philippines. However, the recent high market price of this delicacy has resulted in increased collection in last 20 years. 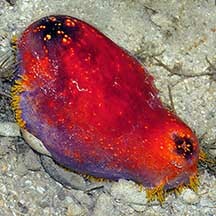 Some edible sea cucumbers are globally threatened by over-collection. 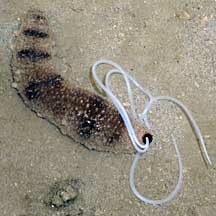 In some areas, such sea cucumbers have become scarce. In others, specimens collected are smaller and have to be harvested from deeper waters. Efforts to culture these edible sea cucumbers have only just started. Many of our sea cucumbers are on the list of threatened animals in Singapore. In Singapore, the main threat is habitat loss due to reclamation or human activities along the coast that pollute the water. Trampling by careless visitors and overharvesting can also have an impact on local populations. warns of its toxic nature. Tube feet used to cling to the stone. its intestines to deter predators. 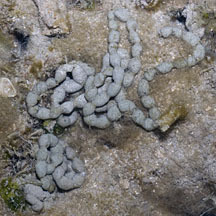 Poop produced by a sea cucumber. commonly seen on a sponge. From Ong J. Y. & H. P. S. Wong. Sea cucumbers (Echinodermata: Holothuroidea) from the Johor Straits, Singapore and J. Y. Ong, I. Wirawati & H. P. S. Wong. 29 June 2016. Sea cucumbers (Echinodermata: Holothuroidea) collected from the Singapore Strait. Family Synaptidae (Synaptid sea cucumbers) with list of species recorded for Singapore. Sea cucumbers Tan, Leo W. H. & Ng, Peter K. L., 1988. A Guide to Seashore Life. The Singapore Science Centre, Singapore. 160 pp. Commercially important sea cucumbers of the world, by Steven W. Purcell, Yves Samyn and Chantal Conand, FAO Species Catalogue. 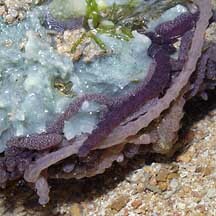 Sea cucumber ranching about cultivation of Holothuria scabra on the wild shores of singapore blog. J. Y. Ong, I. Wirawati & H. P. S. Wong. 29 June 2016. Sea cucumbers (Echinodermata: Holothuroidea) collected from the Singapore Strait. The Raffles Bulletin of Zoology 2016 Supplement No. 34 (Part I of II) Pp. 666-717. P. M. O’Loughlin and Ong J. Y. New tropical caudinid and synaptid sea cucumbers from the Johor Straits (Echinodermata: Holothuroidea). 10 July 2015. The Comprehensive Marine Biodiversity Survey: Johor Straits International Workshop (2012) The Raffles Bulletin of Zoology 2015 Supplement No. 31,Pp. 292-302. Ong J. Y. and H. P. S. Wong. Sea cucumbers (Echinodermata: Holothuroidea) from the Johor Straits, Singapore. 10 July 2015. The Comprehensive Marine Biodiversity Survey: Johor Straits International Workshop (2012) The Raffles Bulletin of Zoology 2015 Supplement No. 31, Pp. 273-291. Lane, David J.W. and Didier Vandenspiegel. 2003. A Guide to Sea Stars and Other Echinoderms of Singapore. Singapore Science Centre. 187pp. Chou, L. M., 1998. A Guide to the Coral Reef Life of Singapore. Singapore Science Centre. 128 pages. Miskelly, Ashely. 2002. Sea Urchins of Australia and the Indo-Pacific. Capricornia Publications. 180pp. Allen, Gerald R and Roger Steene. 2002. Indo-Pacific Coral Reef Field Guide . Tropical Reef Research. 378pp. Pechenik, Jan A., 2005. Biology of the Invertebrates . 5th edition. McGraw-Hill Book Co., Singapore. 578 pp. Hendler, Gordon, John E. Miller, David L. Pawson and Porter M. Kier, 1995. Sea Stars, Sea Urchins, and Allies: Echinoderms of Florida and the Caribbean . Smithsonian Institution Press. 390 pp. Schoppe, Sabine, 2000. Echinoderms of the Philippines: A guide to common shallow water sea stars, brittle stars, sea urchins, sea cucumbers and feather stars . Times Edition, Singapore. 144 pp. Coleman, Neville. undated. Sea Stars of Australasia and their relatives. Neville Coleman's World of Water, Australia. 64pp. FREE photos of sea cucumbers. Make your own badge here.